For more than 20 years, Fine Art Shippers has been providing comprehensive art logistics services both nationally and internationally. Our team of professional shippers of fine art is now one of the best in the New York metropolitan area, but we continue to strengthen the value of our company through network growth, strategic collaborations, high-quality service, and industry-leading on-time arrivals of the transported cargo. For today, Fine Art Shippers offers a variety of fine art handling and shipping services that include everything from art packing to art installation and art storage according to all museum-quality standards. 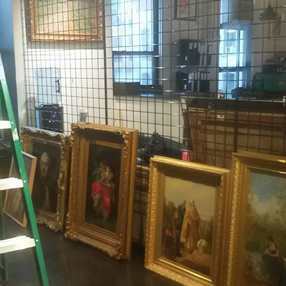 Besides, we are well known for providing superb art crating and shipping services to auction buyers, which allows us to work with some of the best auction houses in the United States and abroad. Our premium quality auction shipping service has made Fine Art Shippers a preferred company for Shapiro Auctions, one of the leading auction houses based in New York City. Our team has been working with this reputable house for many years, and we are very proud to be the number one art shipper on the Shapiro’s shipping list. Moreover, our art crating and shipping services are not the only services that we provide to Shapiro Auctions and their many buyers who purchase art and antiques through this amazing auction house. We also help Shapiro Auctions organize their multiple sales, doing all art installation and set-up work for the pre-sale exhibitions, as well as assist in appraisal and evaluation of various items that are put up for sale. While all the services that we offer to auction houses and auction buyers are important, our art crating and shipping services are still the most popular. First of all, our team is proficient in building custom wooden crates for art and antiques of any type, and we can deliver even the most valuable and fragile items to any destination in the world. Secondly, our art crating and shipping services are very competitively priced, making them affordable for all auction buyers, no matter where they live. This can be easily verified if you request a free shipping quote that we offer online. Moreover, we can even estimate the shipping cost before the auction begins, giving our clients an excellent opportunity to make an informed decision regarding the purchase. Please do not hesitate to contact Fine Art Shippers for any additional information about our art crating and shipping services!